29 | January | 2019 | A balanced diet . . .
Lentils (and Mrs. Vavilov) on my mind . . .
Nikolai Ivanovich Vavilov (1887-1943)—The Father of Plant Genetic Resources—is one of my scientific heroes. Yet I knew nothing about him until September 1970 when I began my graduate studies concerning the conservation and use of plant genetic resources at The University of Birmingham (in the Department of Botany as it was then). Last Saturday, 26 January, was the 76th anniversary of Vavilov’s death in a Soviet prison. Botanist, science writer, and broadcaster James Wong (@Botanygeek) posted a short thread of tweets about Vavilov. So, I tweeted a reply to James about three scientists (two I worked with; the other I’d been introduced to) who met Vavilov in the 1930s. I followed up with another tweet. Actually, Elena Barulina (1896-1957) was Vavilov’s second wife who passed away just two years after Vavilov had been ‘rehabilitated’ by the Soviet government, as she was working her way through his various publications. Vavilov had first married Ekaterina Saharova in 1912, and they had one son, Oleg (born 1918). Vavilov with his first wife Ekaterina, and son Oleg. Vavilov divorced Ekaterina in 1926 and married Elena; they had one son, Yuri (born 1928). Both Oleg and Yuri became physicists, like their renowned uncle Sergey, Nikolai’s younger brother. Ekaterina died in 1963 never having remarried. Elena Barulina and Nikolai Vavilov. Elena (Helena) Barulina was an international lentil expert, publishing an important monograph in 1930. During the course of 1970-71, I got to know this publication in great detail. So how did I get involved with lentils, and what was the outcome? As part of the MSc course requirements at Birmingham, each student had to present a short dissertation. I opted to carry out a study of crop variation, but first I had to choose the species for my study. My dissertation supervisor was Dr J Trevor Williams (who went on to become the first Director General of the International Board for Plant Genetic Resources or IBPGR (that then became the International Plant Genetic Resources Institute or IPGRI, and is now Bioversity International) in Rome. In November 1970, we scanned the pages of Flora Europaea, looking for potential targets among the various legume species. And there, under the cultivated lentil (Lens culinaris) was the important comment: Origin unknown. Now there was a challenge if ever we saw one! I presented my dissertation, Studies in the genus Lens Miller with special reference to Lens culinaris Medik., in September 1971, having used Barulina’s monograph as my lentil ‘Bible’ throughout. I grew a large field trial of lentil varieties and, from my analysis of the variation in morphological characters, some chromatographic analyses, and growth pattern relationships, concluded that the small- and large-seeded forms described by Barulina as subsp. microsperma and subsp. macrosperma were the extremes of a continuous variation pattern, and not correlated with geographical origin. Similar small- and large-seeded forms can also be seen in other legumes like faba bean and grasspea. To analyze the relationships between the different lentil species, I spent several days working in the Herbarium at the Royal Botanic Gardens at Kew, measuring variation in many morphological characters on as many herbarium specimens of lentil species I could get my hands on. I also borrowed herbarium specimens from several other herbaria. In all I must have looked at least a couple of hundred herbarium sheets. Hybrid indices for lentil species. 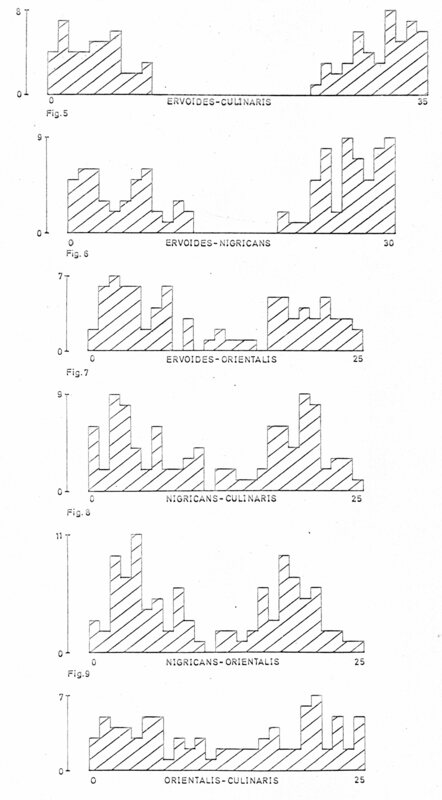 Species were compared by constructing hybrid indices (a numerical method developed and first described in 1949 by renowned American botanist, Edgar Anderson—another scientific hero of mine—in his seminal publication Introgressive Hybridization). This allowed me to determine to what extent variation patterns in lentil species overlapped, or were distinct. Click on the image to the right to see an enlarged version of the resulting hybrid indices. While the variation patterns between some species were quite distinct, the continuity in variation between L. orientalis and L. culinaris led me to the conclusion that we might be describing a wild species progenitor-domesticate relationship. And, indeed, this is what I proposed in my dissertation. A year later, the eminent Israeli botanist Daniel Zohary actually published a paper¹ in the scientific journal Economic Botany arriving at the same conclusion. The studies I commenced in 1970-71 were continued by Carmen Sánchez Kilner the following year, and in our 1974 paper we proposed that L. culinaris and L. orientalis were subspecies of the same species, L. culinaris. In 1979, another Israeli botanist, Gideon Ladizinsky, reached the same conclusion based on hybridization experiments and cytogenetic analysis, in a paper published in Euphytica. Today, I’m sure students would dive straight into analyses of molecular markers to clarify the taxonomy and species relationships. Almost 50 years ago these techniques were not available, so we had to rely on a thorough analysis of species morphology, an approach that is often regarded today as ‘old hat’ but still remains the solid foundation of plant taxonomy. It was an approach that served us well, and our conclusions were corroborated by others later on. I see my studies on lentils as an important link to Vavilov and his colleagues such as Elena Barulina. Also, in later research, I drew on Vavilov’s Law of Homologous Series and its relevance to potatoes, especially with regard to resistance to the cyst nematode (Globodera spp.). It’s also interesting to note just how relevant the ‘Vavilov approach’ still is today (76 years after his death), guiding the exploration and use plant genetic resources to increase agricultural productivity, which was the focus of my career over 40 years. ¹ Zohary, D., 1972. The wild progenitor and the place of origin of the cultivated lentil, Lens culinaris. Econ. Bot. 26: 326–332.